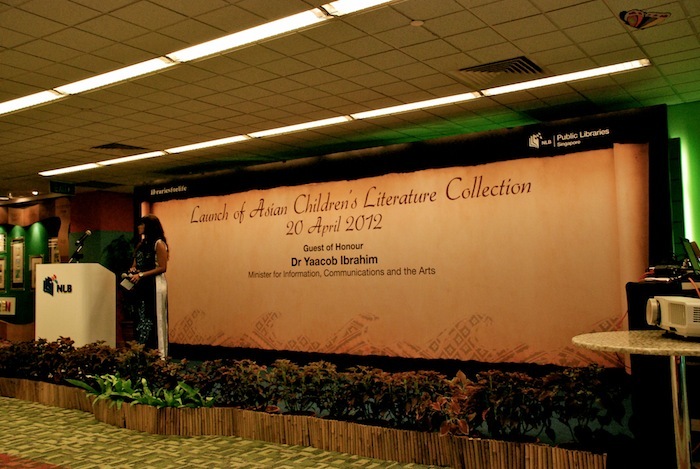 Two days ago, the 20th of April, marked the official launching of the Asian Children’s Literature Collection at the Woodlands Regional Library here in Singapore. 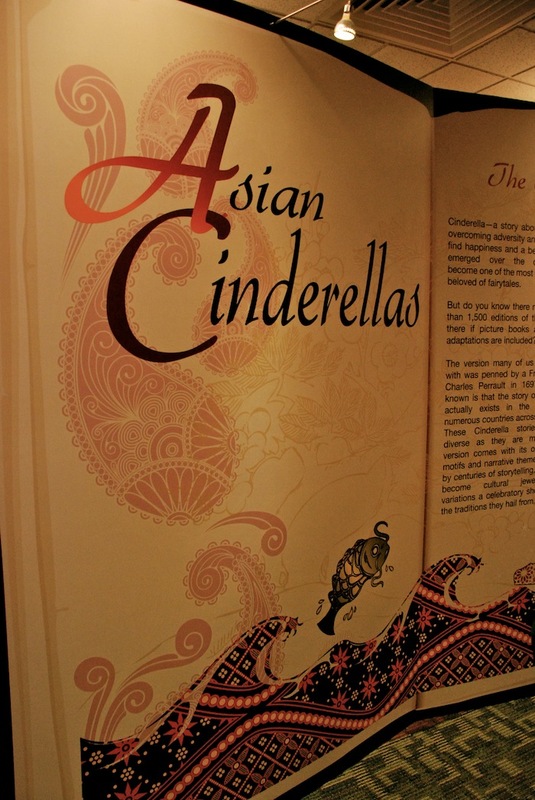 This 15,000 volume collection was originally housed in the National Library as part of the Reference Asian Children’s Collection. 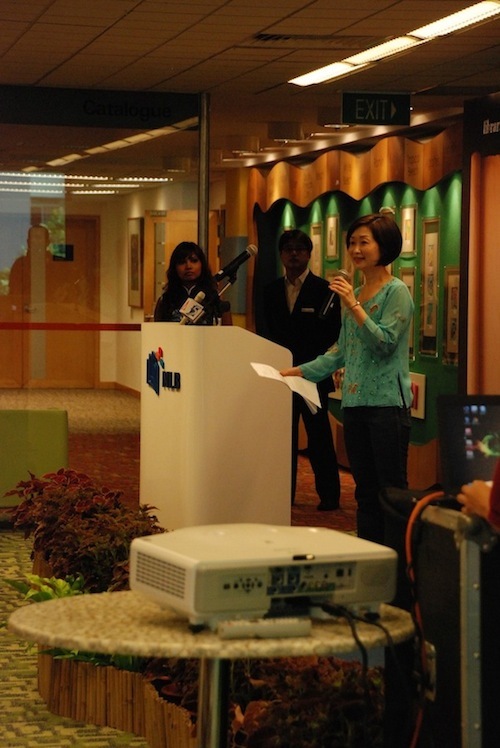 Speech by Chief Executive Officer of the National Library Board, Mrs. Elaine Ng. Photo taken by Roel Bacsal. The collection is likewise mentioned in UNESCO’s website as one of the items in the “List of Nationally and Internationally Significant Collections held in each institution” (http://www.unesco.org/webworld/mdm/administ/en/annex8.htm). 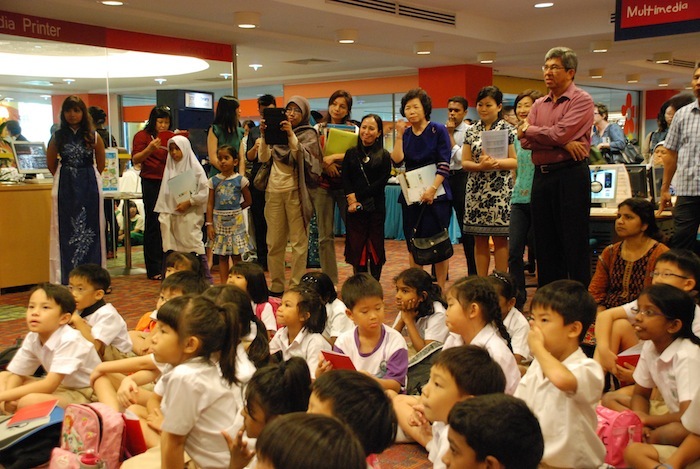 The amazing thing is that over 7,000 books would now be made available in open-access shelves in the Asian Children Literature Room located on Level 4 at the Woodlands Regional Library. Photo taken by Roel Bacsal. There are still items that would be displayed within glass cabinets for the public to see – these are the items considered as not suitable for lending, deemed to be quite fragile, as well as out of print titles and gems. I am seated on the 2nd seat from the farthest right. 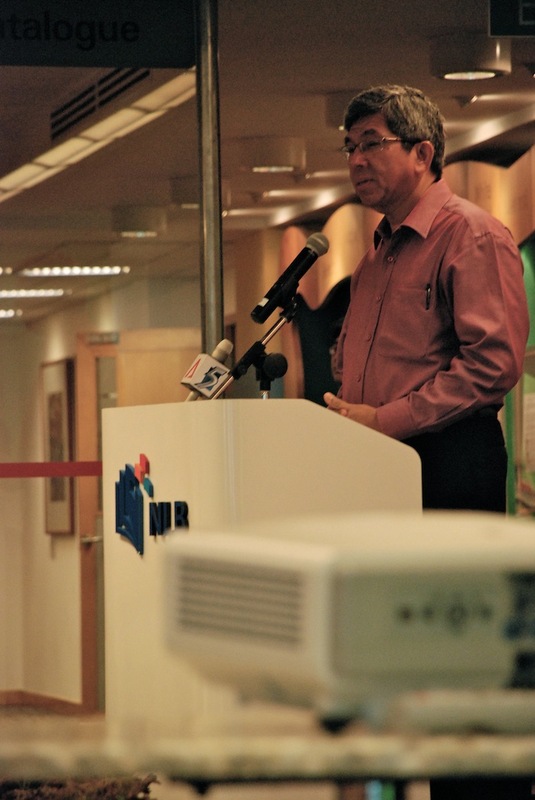 Dr. Yaacob Ibrahim, the Minister for Information, Communication, and the Arts was the Guest of Honor and he gave the opening Speech as could be found in the photos below. 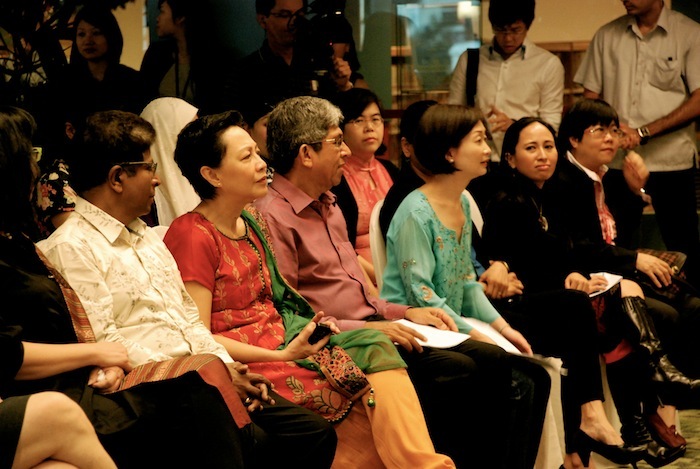 Dr Yaacob Ibrahim, Guest of Honor, Minister for the Information, Communication, and the Arts. Photo taken by Roel Bacsal. 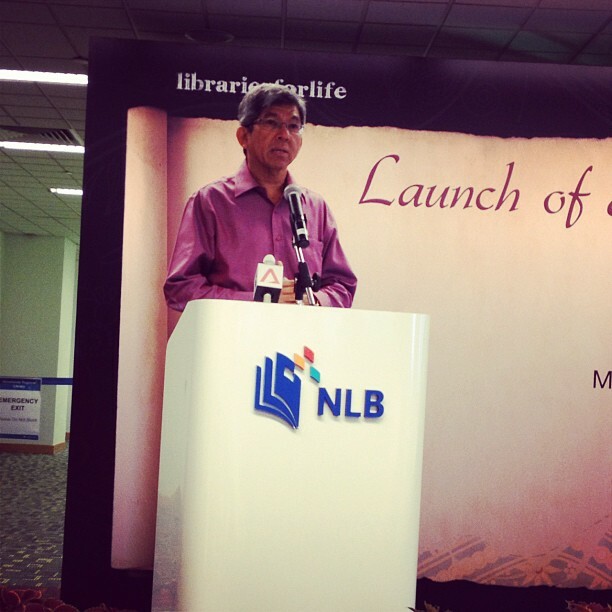 Dr. Yaacob Ibrahim, Guest of Honor. 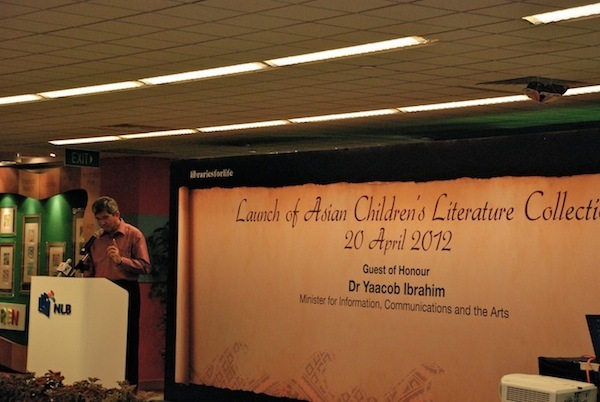 In his speech, Dr. Ibrahim noted that these books would be valuable for children to gain an appreciation of their heritage as well as prove to be a wonderful bonding activity for both parents and children. 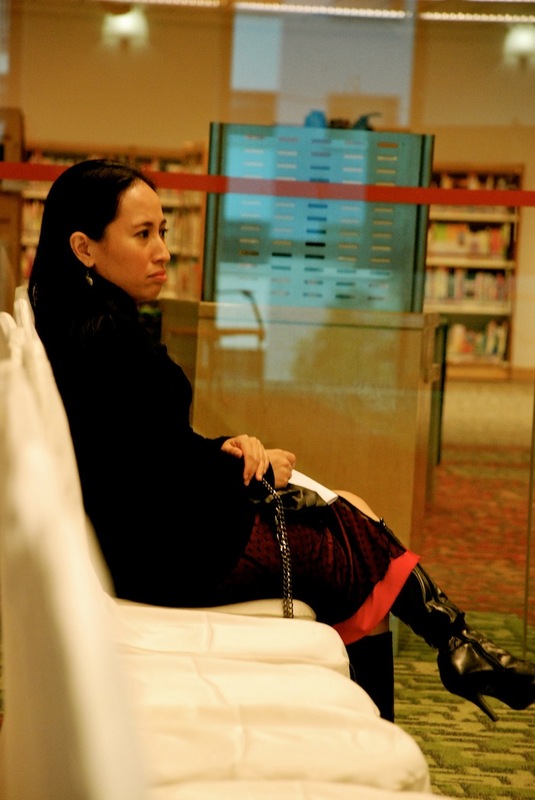 This is me, trying to look stern and forbidding inside the library. 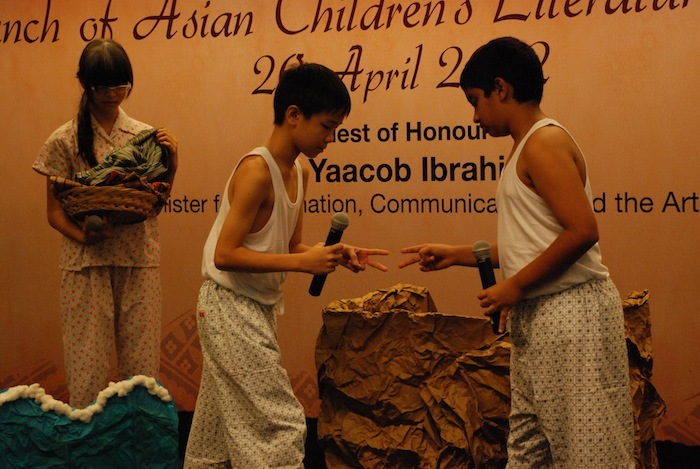 I was also very privileged to have been requested to give a short speech on the importance of Asian Children’s Literature. 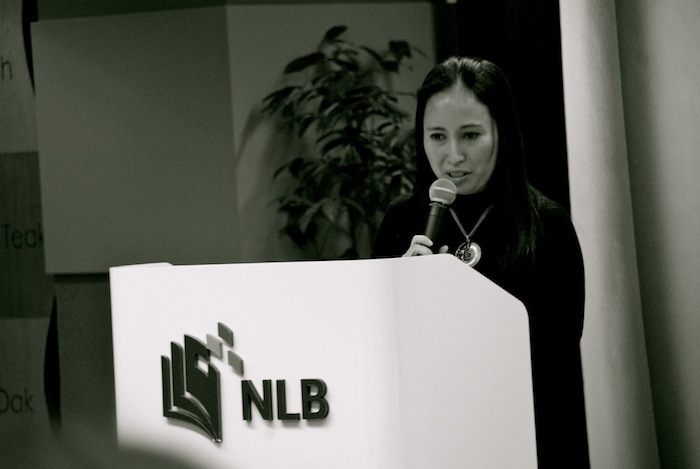 Since quite a number of people asked for a copy of my speech, I thought of just sharing the entire contents of the speech with all of you here, alongside the fabulous photos that my husband took during the event (special thanks and shoutout goes to Mr. Roel Bacsal for his patience and his time in taking all these pictures). This is me giving my speech. 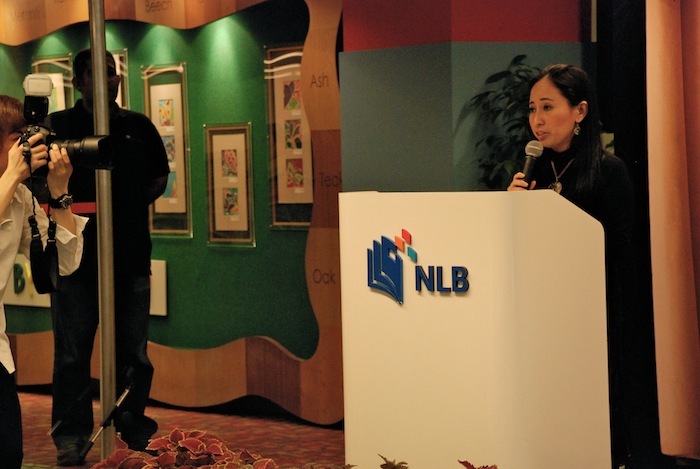 I would like to express my gratitude to the National Library Board for their kind invitation to have me here today on such a special occasion. It is truly a privilege to be here. 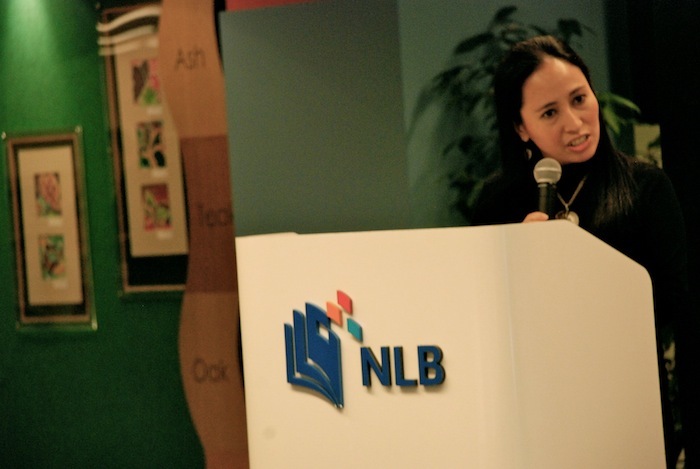 The pleasure is doubled since I have the opportunity to talk about one of my greatest passion: books – in my favorite place in the world: the library. I have read in one of my readings this week that Librarians are the Guardians of Good taste. I would put one up over that and claim that in Singapore, Librarians are the Guardians of Great taste. These lines, I believe are in keeping with what we are celebrating today as we launch the Asian Children’s Literature Collection in the Library. This is something that we can never take for granted. 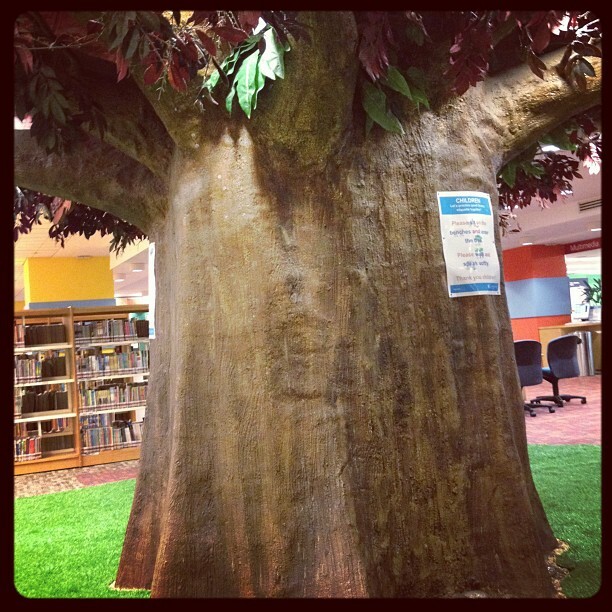 In an age where books are increasingly being set aside, where we hear news of international libraries losing their funding to acquire more books, and as we move towards a digital age where the smell and the feel of the books are not as valued as they should be, today is indeed a celebration. I would also like to note that over and beyond the physical acquisition of reading materials and accessibility of resources, what this launch means is that young children, library goers, the larger public are provided with a space to enrich and deepen our understanding of our cultural heritage. 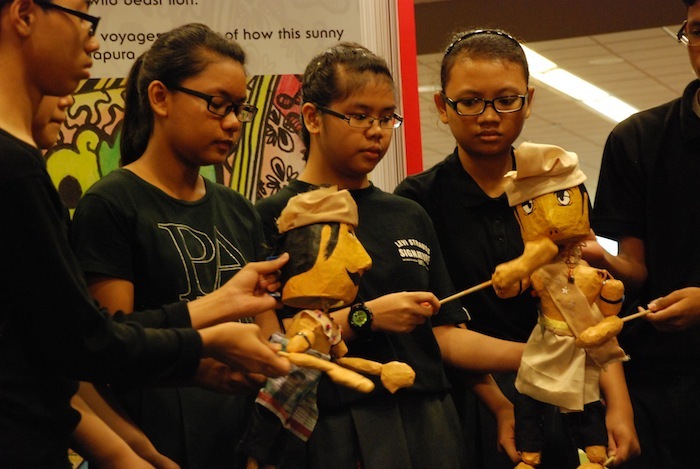 It will give us a chance to gain an appreciation of Asian talents, artistry, craftsmanship when it comes to both the science and art of storytelling. 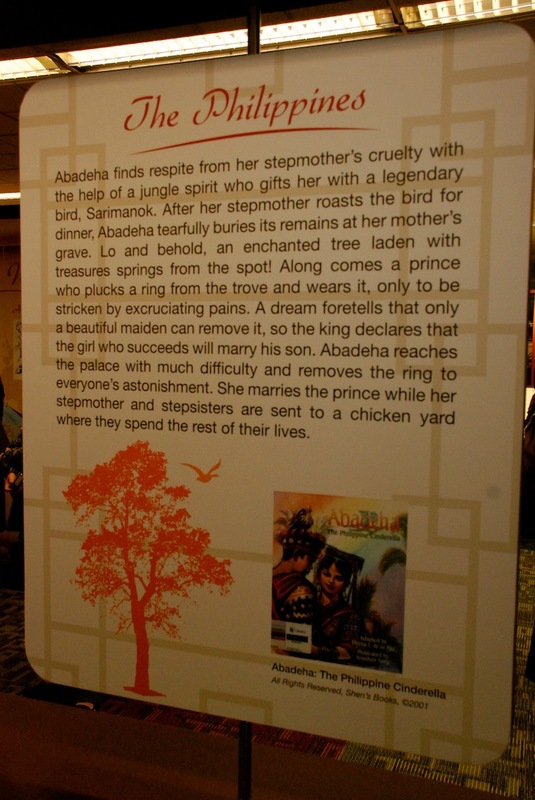 Let me also share with you a few facts and figures about children’s books and the representation of Asian literature internationally. In the recent study conducted by the Cooperative Children’s Book Center at the University of Wisconsin-Madison in 2007, they noted that there are approximately 3000 children’s books in English published in a year. And out of those 3000 books, there is an average of 65 books representing Asians – which accounts for approximately 2% of books published. This was in 2007. I would like to think that since then, the voice of authors, illustrators, artists coming from the region has grown considerably. And our launching this Collection in the library is a testament to that growing voice. 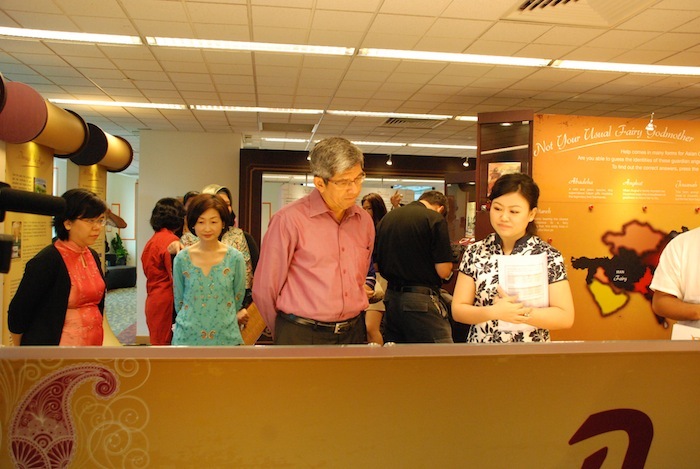 The Minister viewing the rare collection in glass cases. Thus, as we go over the books that we share with our children or students, we need to be aware of whose voices are being represented in the narratives. How authentic is the voice? 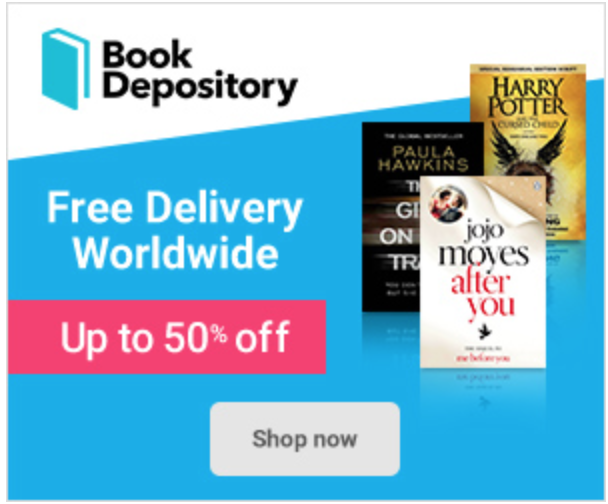 How accurately are characters portrayed – do the books as amazing as they may originally appear to you, accurately represent the food, rituals, clothing, cultural practices of the said country? What is the background of the author? What are his intentions in creating the book? We can not just be passive consumers of reading materials. If the book is meant to be a historical narrative, parents/teachers should look for historical notes that would provide some evidence of the historical information shared in the book. As we enjoy and look at some of the delectable spread that we have before us today, I know that most of you may be wondering about which books would be most suitable given your children’s age ranges, which ones could teachers and parents alike share with their own kids or students in the classroom, this would be my cue then to invite you to the upcoming Asian Festival of Children’s Content which will be held on the 26th of May until the 29th. I only have a few minutes of your time so I won’t be able to engage you in a great deal of booktalk about literature that has moved me immensely or share with you some of the titles that have literally blown me away and left me awestruck, but there will be a lot of opportunity to do that when you do attend the AFCC which, by the way, is doing a regional focus on the Philippines. This launch provides us with the dual function of deepening our aesthetic awareness and nuanced understanding of our heritage and provides us with an expansive knowledge of who we are and our place in the world. 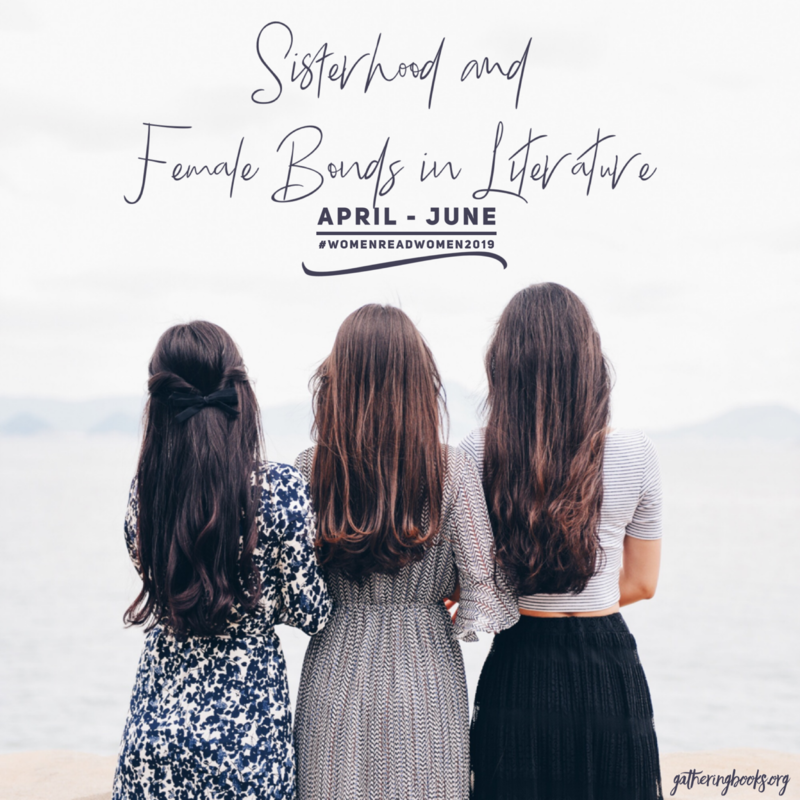 While we are made aware of our collective heritage and our individual differences based on our geographical locations, we also need to take on a more global perspective as the world is seemingly becoming smaller (yet paradoxically larger) each day. 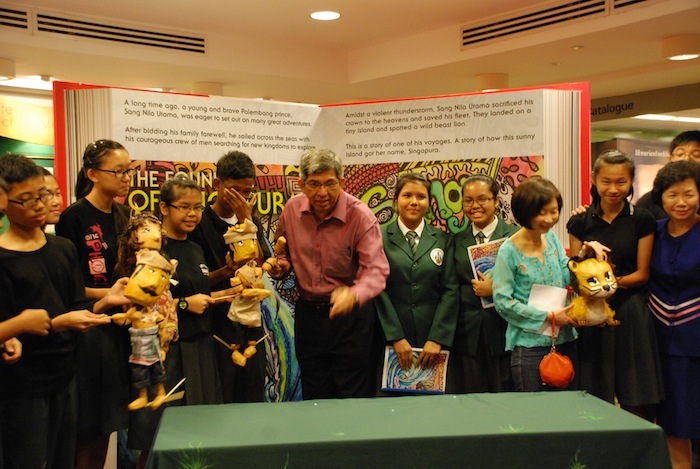 One of the ways through which we can gain this kind of global awareness is through exposure to literature that would open children’s eyes to become more discerning members of the global community. 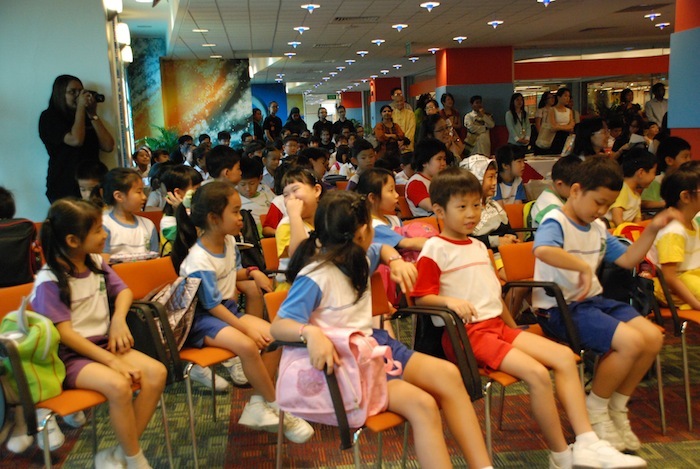 May this launch be the signal of that burgeoning universal republic of childhood here in Singapore. 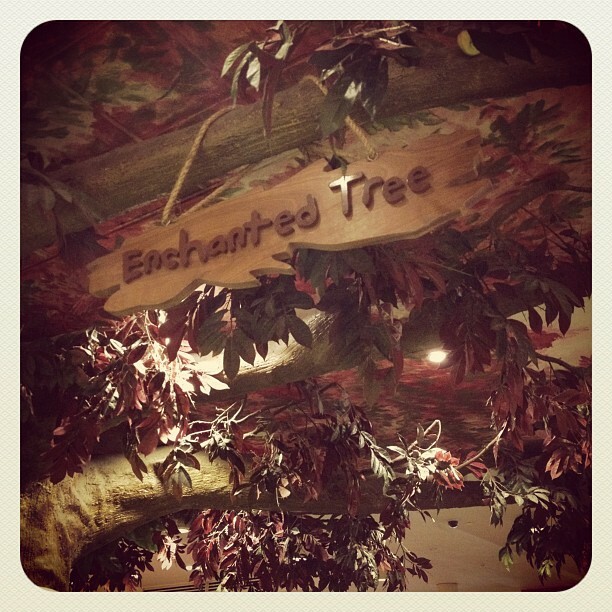 An enchanted tree inside the Woodlands Regional Library!! 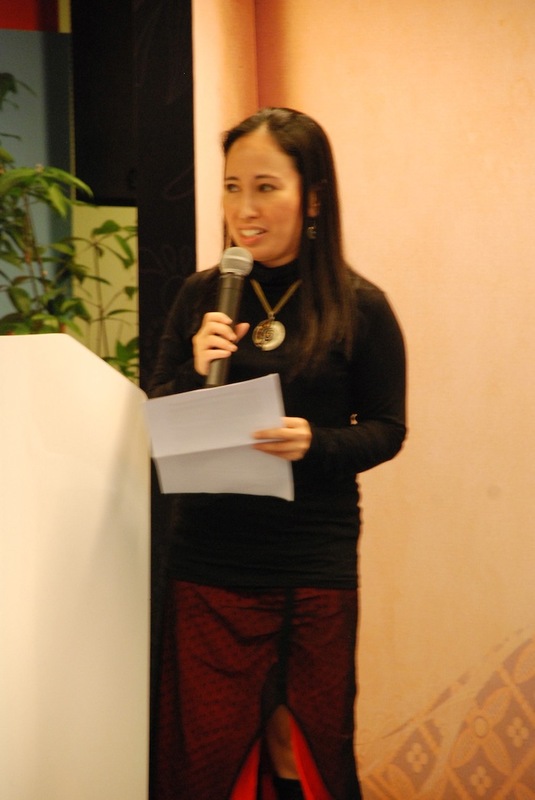 *All photos of the event are taken by Roel Enrico D. Bacsal. This looks like an outstanding library collection! Wow! And I love your speech and am shocked though somehow not surprised that only 2% of books being published represented Asian authors in 2007. 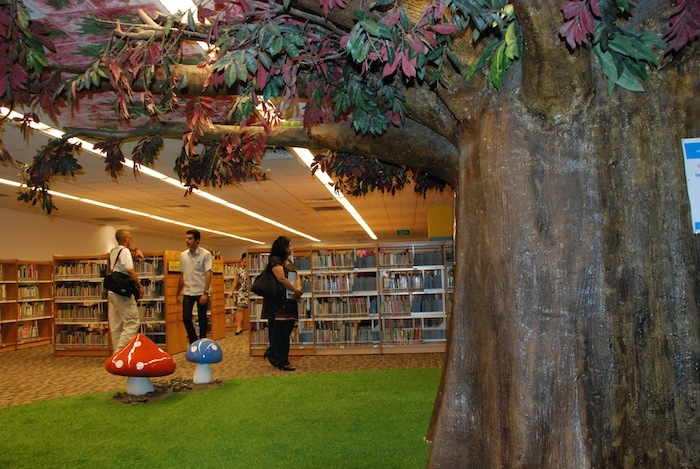 I am glad that figure is changing…Well done and I hope to visit that library with my kids sometime when we visit Singapore! Truly inspiring. Hi Jackie, I totally agree, it IS an amazing collection. The libraries here in Singapore are simply awesome. I can get lost in them. I have a feeling you and your kids would enjoy it here, truly a beautiful place. Myra, I’m so sorry I haven’t visited. Wow! Wow! What an exciting event and opporutnity to speak. I enjoyed reading your speech and was interested in the percentage of books that represent the asian culture surprising. Good to know. Deal with a similar issue of representation of children with special needs. 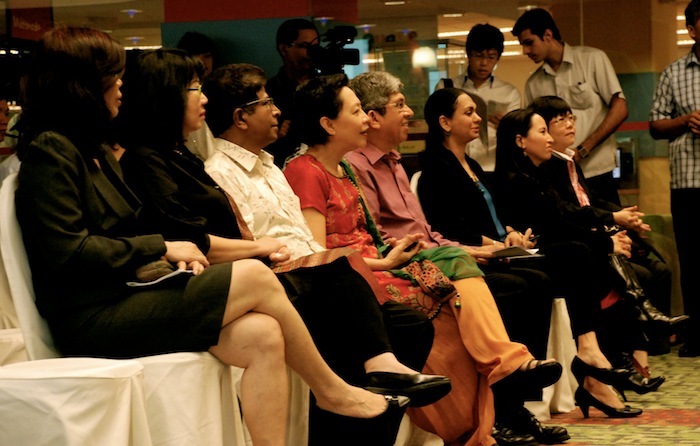 Tell you husband he did a beautiful job of photgraphing the event. It looked wonderful. 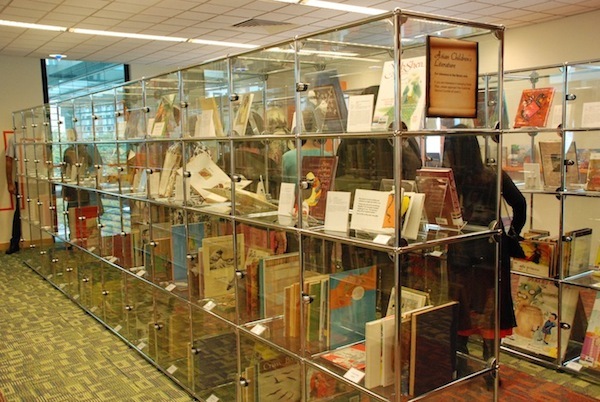 Oh to look at the books on the glass shelves!! Beautiful post. It looks like it was a spectacular event. And with many important people invovled. Believe, I would have written out the speech too! I am so happy it was such a success!